Cosmetic Dental Recontouring is a reshaping procedure for chipped, cracked or slightly irregularly shaped teeth. Dental contouring and reshaping can be used to grind away and smooth minor chips or wear in teeth. Dental contouring can also remove and smooth imperfections, pits, and ridges in the teeth where dental plaque and tartar easily builds up. 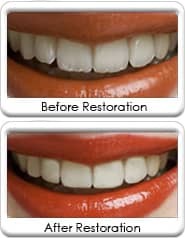 Cosmetic Dental Recontouring is useful for small chips but cannot take the place of bonding or veneers. Cosmetic recontouring is not recommended for teeth that have deep chips or fractures or large fillings. Some imperfections, which are unable to be removed by contouring alone, may require cosmetic dental bonding. Dental Cosmetic Recontouring is typically performed without local anesthetic. Time to complete - Dental contouring takes about 15 to 30 minutes per tooth to complete. Procedure - The tooth or teeth are cleaned and dried. A dental sanding instrument is artfully used to eliminate or minimize imperfections on the surface of the teeth. Sandpaper-like strips are used to manually polish the sides of the teeth. The re-contoured teeth are smoothed and polished.